This year I replaced the rotten core in my Tanzer 22 cockpit. Why exactly do I need cushions in the Tanzer? My Sweety cares about things like cushions. He is not greatly interested in sailing per se, but he is far more likely to come with me if he is comfortable. One of the first questions he asked me about my new boat was about cushions. SO... while I was waiting for the fiberglass to set in my cockpit floor as I repaired the rotten core, I took a pattern for the cushions. In my costume making stores, I had a plastic mesh used to reinforce the structure of clothe called pellon. It is stiff, doesn't stretch or tear and can be pinned. I used this to make a pattern. I just put it on the seat and used a marker to show the finished size of the cushion. I then added one half inch all around to give a seam allowance. I rolled up my pattern and took it to the foam store. The cushion fits better if it's slightly tight on the foam so the fabric gets cut the same size as the foam and this makes for a struggle to get the foam into the cushion envelope. Some people use silicone to make the foam slippery, but I avoid the stuff like the plague because it interferes with finishing and paint and I'm always working with that around my boats. For the un-itiated like me, foam is foam. I could not have been more wrong. Foamology is a complex and no doubt fascinating science but all I wanted were cushions to keep Sweety happy. I also wanted these cushions to last till judgement day because I'd rather be sailing than making cushions! Cushions can be kept dry by using waterproof fabric. There is also closed cell foam that does not absorb water. Because I don't like the feel of vinyl fabric I chose to make cushions that allow water in but drain and dry quickly. 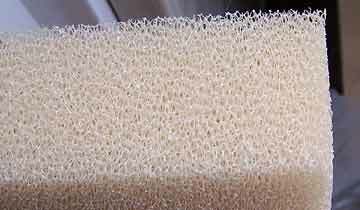 So the foam I chose for my Tanzer cockpit cushions was a fast drying foam that allows water to drain very quickly and doesn't sponge up and keep water in its cells. I think it is called quick dry. It was expensive and I hope the investment was worth it. Close up of the foam I used. It is 2 inches thick. I could have used a thinner grade but it was only available in 1 or 2 inches thickness. It is quite coarse and feels hard to the hand. The open structure allows water to run right through. The foam shop cut the foam to my pattern. it's tricky to do at home. I've done it with an electric knife but not so easily. I wanted a fabric that dried quickly, did not absorb much water, did not rot, and had some UV protection. I also required something that had some body because my foam is not soft. I went to a few fabric stores and looked at outside furniture fabric. There is quite a range of fabrics you can use. The vinyls are waterproof, there are fabrics woven with plastic threads, and others woven with various other fibers including cotton, acrylic and polyester. I chose a polyester fabric because I liked the feel and the look. I also liked the price. It was a remnant store that had a lot of outside fabrics. They were good quality but not priced as boutique stuff. I will not be able to ever get any more but what I have will last. This fabric was a good width at over 60 inches. I think fabrics such as Sunbrella would do just fine. Sunbrella Material, 60" Width Pacific Blue, Marine Applications Sold By-The-Yard 60" x 36"
I washed and dried the fabric in case it shrank when it got wet and ruined the cushions. Tilley concentrates on being heavy to keep the pattern in place. She doesn't want to look at me because she thinks she is getting away with something. 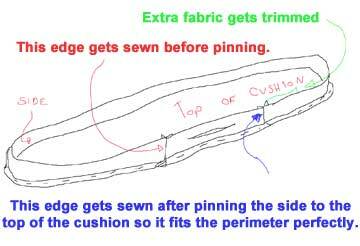 I've pinned the pattern on the fabric and am cutting the top piece. BEFORE CUTTING plan and think and plan again. I was making 2 cushions. I needed 4 tops (2 of these reverse because my fabric has a right and wrong side), I also needed long pieces for the sides. I also wanted to make cushions with piping. That's what I call the cord that you sometimes see on the edges cushions. It makes square edges and gives a finished look to the cushion. I also wanted my piping to be solid blue so it would not show dirt, so I needed to be careful cutting the striped material so I could get all my pieces and match the colours. Lining up the fabric on the square is important because it stretches more on the diagonal than square lengthwise or width-wise. I imagined a line running from bow to stern in the middle and treated this as straight. Luckily one of my edges followed the imaginary centre line so it was easy to align the pattern. I've cut the sides. 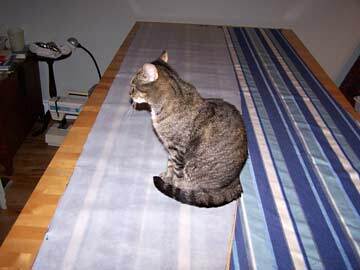 I had planned my length to allow me to cut the strips with no joins. The opening to allow the foam to be wrestled in gets made and sewn in to make the length of the side go all the way around. it's better to have some extra than to be too short. The top gets cut the same size as your foam. I cut my sides one fat half inch larger than the width of my foam. This is to allow the foam to be compressed after sewing in the side. It will have 1 inch of seams so your side will end up one scant half inch smaller than the foam. My foam was quite hard and did not compress as much as other foams do. It's quite a lot of work to make the piping but it makes a nice professional looking cushion. 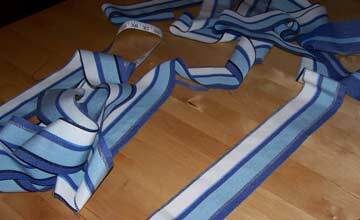 The blue strip that will become the piping was about one and three eights wide. 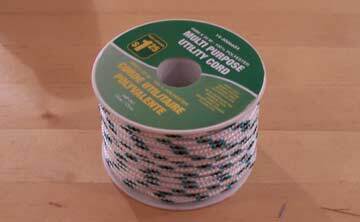 Dollar store cord for piping comes in reels or just coiled. The strip gets pinned at right angle. I made sure the colours were lining up. 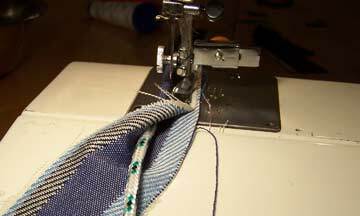 After sewing, the extra can be trimmed at about one half inch from the seam and ironed flat. Completed piping ready to be used. It will get sewn on the edges of the cushion seams and give a nice finished look. I had to cut various strips and piece them together. This seam is made diagonally so as to not concentrate thickness in one spot. I don't care if the edge colours don't match perfectly, I'm only interested in the central dark blue area. 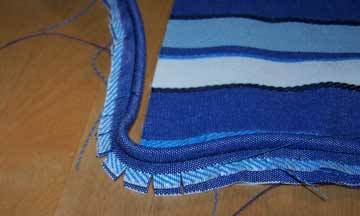 The seam will come out perfectly if you have cut your strips evenly and sew from the 2 edges shown by arrows. Make sure they are accurately pinned at right angle. 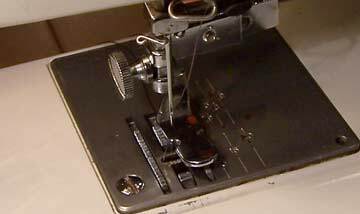 The sewing foot allows the needle to go right on the edge. I use this sewing foot to put on zippers. It's not expensive and often comes with sewing machine. The machine comes with a box full of little mysterious feet and attachments and no one ever uses most of them. They often don't even come with instructions. Mine was not great and I broke several needles because of the poor clearance. I am using large needles and the best quality I could find. I am also using extra strong polyester thread. I am using dollar store cord to stuff the piping. There is commercial piping stuffing material available and it is quite expensive. I don't think it wears any better than the cord. The stuff in my fabric store was cotton and would rot. It was also very pricy. The cord I used is synthetic, and I used it on my boat, so I know it lasts. Close up of Temporary stitch that holds piping in place. 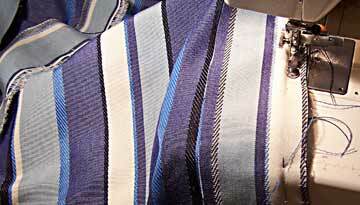 It is applied to the good side of the fabric top and bottom. When I had basted all the way around the perimeter, I trimmed the inside cord so the end butted with the beginning, and left some extra blue fabric which I folded in and finally sewed the piping end to the beginning. it's not perfect because my fabric is quite thick but it's neat. The piping gets basted onto the top and bottom of cushion. Note that the edge is towards the outside. (Some people have used staples to hold the piping on. They need to be removed after and also be placed away from the piping otherwise the sewing machine will run over the staples and break it's needle.) I think I get more control using big stitches hand sewing. Note the clipping on the corner. The top has been cut with a radius on the corner. It is not a sharp corner. This makes it easier to sew and it looks better. The opening for the foam often has a zipper inserted. I have decided to sew the cushion closed. I am not planning to ever take this apart. In my interior cushions I will add zippers to allow for cleaning or removing skudzy foam. 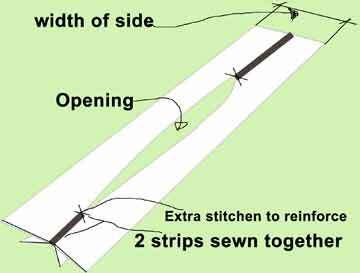 The opening is made separately and sewn to the side strip.The opening is made from 2 strips. These are cut each a half inch wider than the width of half of the side, The extra half inch on each strip is a seam allowance for when the cushion is sewn closed. Once the opening part is made then it is sewn to the side strip. Only one side is sewn at first because the side has to be adjusted to fit exactly to the perimeter of the cushion. I cannot measure accurately enough to sew both ends before attaching to the top. The side including the insert needs to be pinned to the all around the top edge. Once it's been pinned all around it's a simple matter of adjusting the length and sewing the side to the opening insert so it fits perfectly around the top. These photos are out of order to explain the opening better. Cushion being sewn. The side was pinned to the top, which has the piping attached. It is important to place the opening insert first so it is placed correctly roughly in the middle of the back edge. This is the edge that will be against the side of the boat and not visible. The edge was carefully pinned starting at the unsewn end of the insert. Eventually the side strip was pinned all around except for the unsewn end of the insert. This was carefully connected and sewn. It was then a simple matter to finish pinning the side to the bottom. The side needed to have the extra material trimmed but it fitted perfectly on the top. The corner needs to be clipped so it fits. See the clipping and basting of the piping image on the corner further up. This allows the side to fit better around a corner and make a neat corner once it's turned over. Side was sewn to the top very near the piping cord. You need a special foot to get close enough I think. The bottom was attached in the same way. The only tricky part is to make sure the top is aligned to the bottom. This is done by carefully pinning the corners first then pinning between the length between the corners. It would help to make marks or notches when the top and bottom are cut out to have reference points. If it does not align well you will have stretch lines and your cushion will twist. 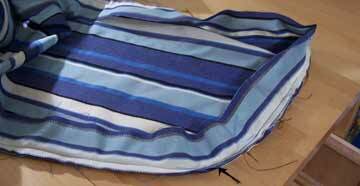 Once the bottom was sewn I zig zagged quickly around the perimeter to stop the fabric from unravelling. No need to be particularly accurate here. My fabric is quite stable so I did not need to finish the edge before I did my sewing but sometimes it helps. The Tanzer cushions were turned right side out and checked for any problem. Odd threads were cut and the foam inserted. This was somewhat annoying. I managed by rolling the foam and unfolding it after it was in the cushion. It brings home the point that the opening MUST BE LARGE ENOUGH. Mine was just barely large enough. After much pulling and pushing and manipulating, the foam finally went in. One thing to check is that the inside seam allowance rests against the side, not the top This makes the edge better defined. I was able to adjust this seam after closing but it took some time. The opening was hand sewn. I positioned the edges by sticking pins right into the foam through the fabric. The cushion will need some adjusting after closing but it should smooth out and fit quite well. After a year the cushions are still good. Spiders have pooed on them some and it is hard to get the stain out even after scrubbing. Otherwise they are holding up. Sweety has not developed a great love of sailing in spite of the cushions. They are thin enough that I can sort of fold them up and throw them in the cabin when I am putting the boat away.